WASHINGTON, D.C. – The U.S. Chamber of Commerce’s Global Intellectual Property Center (GIPC) last night hosted the 5th annual IP Champions event to showcase intellectual property’s economic and cultural impact. At the gala, GIPC announced that it will rebrand to be known as the Global Innovation Property Center. 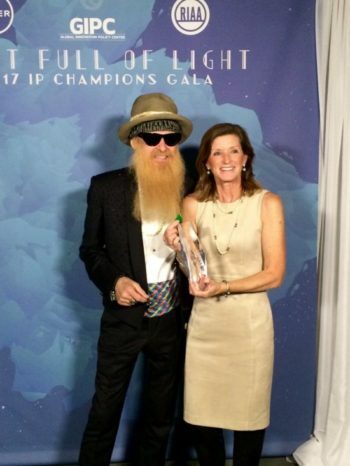 SBE Council president & CEO Karen Kerrigan was honored alongside ZZ Top’s Billy Gibbons and other IP Leaders at the Global IP Center’s annual IP Champions gala on November 14. Gibbons also performed for attendees. The IP Champions Gala brought together a wide array of industries to celebrate those who generate jobs, encourage innovation and creativity, ensure safety, and promote access to new creations. In addition to improving lives through innovation, IP plays a major role in America’s economy. IP-intensive industries directly employ over 45 million American workers and drive over $6 trillion worth of total U.S. GDP. Karen Kerrigan is the president and CEO of the Small Business & Entrepreneurship Council (SBEC). Kerrigan’s advocacy work on behalf of the SBE Council focuses on key issues impacting entrepreneurs, small businesses, and the American and global economies. She regularly provides counsel to government and industry leaders regarding the positive development of entrepreneurship and small business through strong public policy.